It was the tradition in the family that there were 9 graves in total ( viz. 3 attaching to each of the Headstones 10, 11 & 12 ) and that any one of the extended family could be buried in any of the 9 graves depending on which was most suitable at the time of burial. GRAVES NOS. 10, 11, 12, 13 and 28 are those of various members of the O SULLIVAN family. TIM MURPHY who is buried in Grave No. 51 was married to HANNAH O SULLIVAN. DARBY SULLIVAN, who is buried in Grave No. 65, may have been the father of the JEREMIAH in Grave No. 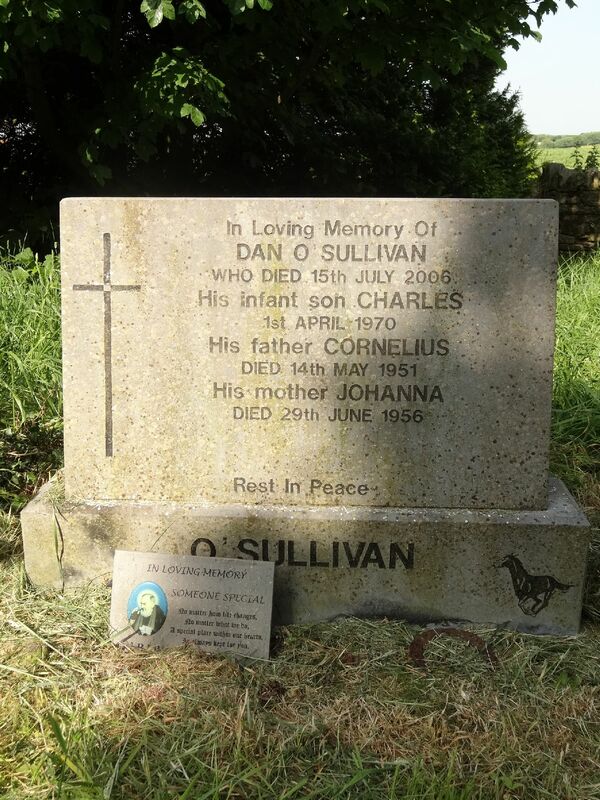 11 as there was a family tradition that the earlier generations of the O SULLIVANS were buried closer to the road and nearer the then entrance. The O SULLIVAN family were dispersed in several places viz. _ ST. PAUL, U. S. A. This Headstone replaced another headstone erected to DANs parents CORNELIUS and JOAN O SULLIVAN. That headstone, in turn, may have replaced a much earlier headstone. 1. MORTIMER (MURTY) O SULLIVAN ( CORNELIUS 's father ) of KNOPPOGE and KILSHINIHAN who died on 8 / 4 / 1940. 2. MURTY 's wife JOHANNA (nee CROWLEY , Cashelmore ) who died on 15/ 3/ 1949. 3. CORNELIUS ( CURLY ) O SULLIVAN ( MURTY 's father ) of KNOPPOGE and formerly of RIVERSDALE, Kilbrittain and BALLYSHONEEN, Waterfall. CURLY died about 1860. 4. ANTHONY O SULLIVAN (infant son of JEREMIAH & EILEEN O SULLIVAN of Kilshinihan, Timoleague) and grandson of MURTY O SULLIVAN. Anthony died on 13 /6 / 1951.